Polylab kipp's apparatus made of polyethylene has three main portions. We are one of the trusted manufacturers and exporters of PSAW Kipp's Apparatus, which are made of polyethylene and have three main portions. 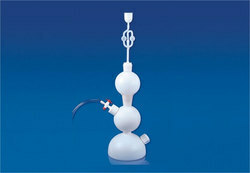 The top portion of the apparatus is fitted with a thistle funnel and a bulb structure through which dilute acid are poured that reacts with a metal sulphide in the base of the apparatus. 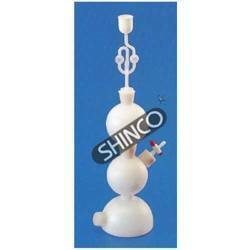 We are leading manufacturer, supplier and exporter of Kipps Apparatus. Kipp's Apparatus (Soda Glass): Complete with delivery tube, thistle funnel and rubber corks. We deal with all type of Chemical Equipment, just send your quotation at our email id and get and estimate within 24 hours.